Tag line: "Follow his rules this January"
Man, I really enjoyed the first 3/4 or so of The Boy, which makes the ending all the more frustrating to me. Even now, as I sit in front of my laptop, I can’t decide whether or not the disappointing conclusion ruined the movie for me; is there still enough here to make The Boy a worthwhile watch? Well, let’s see where this write-up leads us, shall we? To escape an abusive relationship, Montana native Greta (Lauren Cohen) flies off to England, where she’s accepted a temporary position as a nanny for a well-to-do couple about to go on holiday. But when she arrives at the spacious Heelshire estate, she’s shocked to discover that Brahms, the young “boy” she’s been hired to look after, is, in reality, a porcelain doll. Both Mr. Heelshire (Jim Norton) and his wife (Diana Hardcastle) treat the doll as if it is, in fact, their son (who we come to learn died in a house fire some 20 years earlier). Though she finds it bizarre, Greta (who needs both money and a place to stay) plays along, and agrees to follow the list of rules that Mrs. Heelshire put together, which includes giving Brahms his daily lessons and reading poetry aloud to him. Of course, the minute the Heelshires leave for their vacation, Greta all but ignores the Brahms doll, and spends her time chatting on the phone with her sister and flirting with Malcolm (Rupert Evans), who owns a local market and delivers goods to the estate several times a week. Then, all at once, strange things begin to happen: while she’s taking a shower, Greta’s clothes disappear; and at night she hears what sounds like crying coming from Brahm’s room. It isn’t until Brahms “talks” to her, however, that Greta believes the doll is alive. From the 1945 anthology Dead of Night to the opening scene of 2013’s The Conjuring, dolls and ventriloquist dummies have left an indelible mark on the horror genre, and, when handled properly, these lifeless “toys” can single-handedly send a shiver up your spine. Well, for about an hour or so of The Boy, the Brahms doll is creepy as hell, from the way Mrs. Heelshire dotes on it (carrying it around, giving it loving kisses, etc) to Greta’s experiences with it in the days that follow. Aside from the shower incident mentioned above, Greta at one point notices the doll, which spent the entire day lying on its back, is suddenly staring directly at the doorway. This is but one of several disturbing occurrences, all of which suggest that Brahm’s spirit is alive and well inside its porcelain doppelganger. Even if we set aside the film’s annoying “jump-scare-that’s-really-just-a-dream” sequences (that’s right… the movie drinks from this formulaic well not once, but twice), The Boy offers up its fair share of genuine thrills. Equally as potent (and sometimes just as spooky) is the relationship that develops between Greta, so wonderfully portrayed by Ms. Cohen, and the doll. Having lost a child of her own as a result of domestic violence (her boyfriend beat her while she was pregnant, causing her to suffer a miscarriage), Greta finds she not only accepts that the doll is alive; she’s invigorated by it, and begins talking to “Brahms” as if it was an actual child. Along with its supernatural elements, The Boy also works on a psychological level, and we wonder if Greta’s subconscious is playing tricks on her. And then, out of the blue, we find out what’s really going on. And it’s an absolute letdown. After spending the better part of an hour and 15 minutes weaving a dark, twisted tale of the supernatural, The Boy veers off in a different, and altogether unsatisfying, direction. Not to worry: I won’t spoil it for you (even though this ending damn near spoiled the movie for me). 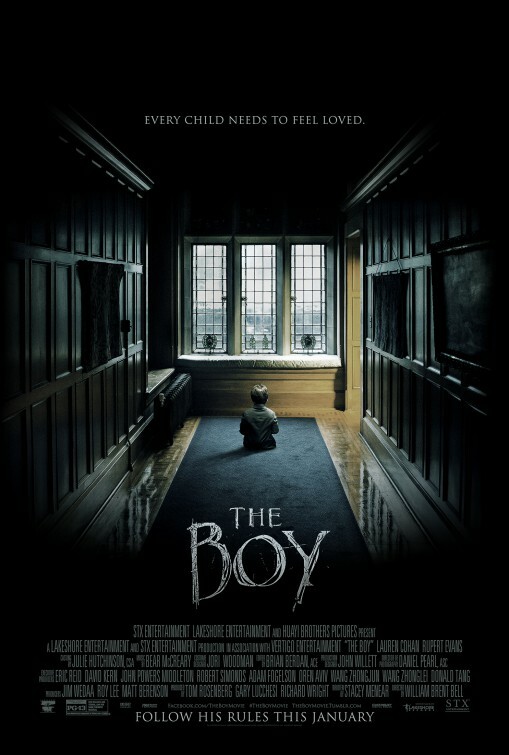 Ultimately, I’m torn; for quite a while, The Boy is an effective horror film, and I wouldn’t want to deprive you of its early successes. But I can’t, in good conscience, recommend it wholeheartedly thanks to its awful conclusion. So, with the above to guide you, the decision to watch The Boy or avoid it is yours. Sorry I couldn’t be of more help.